Keeping my house clean can be a real challenge with kids. Keeping the kids clean is even harder! But with school back in session, I know what’s going to happen: Hands in the nose, then hands on the walls… then high fives somewhere in between. I’ve found that insuring that I have some go-to green habits ready has helped me with preventing germs in my home, and I know they can help you with keeping germs out of your home too. 1. Windows: Use a homemade formula of 4 tablespoons lemon juice mixed with a half gallon of water for clean windows, no need for toxic ammonia-based window cleaners! 2. Floors: Keep it green when you de-germ by mixing 1 cup vinegar with 1 gallon warm water to mop your indoor floors. This efficient formula is mild and kid friendly so it requires no rinsing afterwards, which saves time (and water!). To make green cleaned floors even shinier do a quick mop with club soda! *Green tip: Get the family used to removing their shoes at the front door – it will prevent them from dragging dirt and germs from outside into your clean green home oasis. 3. Hands: Creating hand-washing routines for your whole family will assist you greatly with keeping germs out of your home. Simple “rule” times in which hand washing can be added to your family’s routine: upon entering the house, upon entering the kitchen, and before and after eating. *Green tip: Be sure to use mild hand soap instead of the antibacterial kind because antibacterial soaps kill “good” bacteria and slowly lower your body’s germ defenses. 4. Kitchen & Bathroom: Change your hand towels daily. It’s green to dry your hands on a hand towel rather than using paper towels, however it’s important to remember to wash and switch out those towels at least once daily as the moisture they hold can attract germs. 5. Too Busy? Hire a green cleaning service. I’ve found that when I’m swamped with work and so is my husband; the last thing I want is for my house to become a swamp. 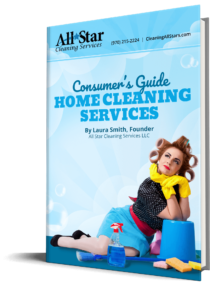 Having a green cleaning service at hand has been a huge help for me! When I can trust that my home is germ free and kid friendly, I feel guilt free.